A coworker and I were lamenting the fact that we can't post our blogs to Blogger at work. Big Brother is watching us constantly, and Blogger and all it's Googly cousins are blocked. She came up with the idea to switch to another blog host. I was thinking about it- most of the bigger blogs I read are on Wordpress, Typepad and/or Tumblr. I always thought they either cost money or were too hard to use. Well, they don't and they aren't! So this blog is now moving over to Wordpress. Thank you, Blogger, for making it easy for me to blog these past few years. And nothing against you, Blogger. I have a backlog of posts in my email inbox waiting to be posted and no time when I get home to do so. You can now find me here! Don't forget to change your bookmarks! "How's Dad doing?" "How's your father holding up?" I get these questions often. We celebrated my niece Lily's 3rd birthday today. During the party, my in-laws asked me how Dad was. Last Friday at our monthly meeting, I haven't seen my friend Toufek in a while. I was training him to work in one of my buildings while Mom was at the end of her fight with cancer and the doctors had told her they can't do anything for her. I spent the majority of the time on the phone with Dad crying and then apologizing afterwards for not working. He understood and left me a very heartfelt phone message after Mom passed. Friday he considerately asked me how my Dad was doing. How is my Dad doing? I'm sure he has his moments and times where he gets sad, but honestly? I think Dad is doing freaking great! Dad reads my blog. (Hi Dad!) He discovered it when I sent him an email- the blog address is in my signature. I was a little chagrined that my DAD was reading all my inner thoughts and crap that I deem important. (GOD- did he read the bloody Diva cup post? I sincerely hoped he skipped that one.) A quick glance at my blog list- nah, there's nothing in there (except the Diva cup post) that would make me a little squirmish when I saw Dad. So because today is his birthday, I want to dedicate this post to him to tell him how proud I am of him. He's doing all the things Mom did all those years- shopping, banking, paying bills. He buys birthday gifts for the family. He found a new insurance company for the house. He pimped out his truck- ghostly flames and LED lights. He tried Thai food. So did I. 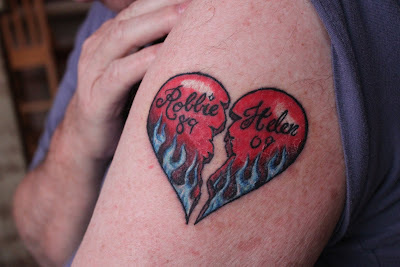 Dad's heart tattoo honors my Mom and my brother, tricked out with blue flames to match his truck. I finally got my poison ivy tattoo- my little talisman against getting poison ivy every year. Mine also honors Mom and my brother, Robbie, as well as our friend J. 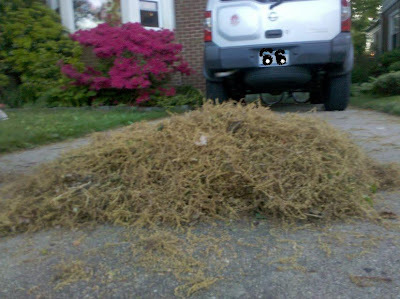 Can you see the initials in the vines? While mine hurt like hell, Dad didn't flinch, he claims it didn't hurt at all. I wish I had his nerve endings. He's already planning on going back this week to add more to his tat! Someone's addicted! I've been inked with my daughter, now I got inked with my dad. The guys at Sparrow Tattoo in West Hempstead said they've never had that combination before. Then today, I get the surprise of my life-an email requesting me as a Facebook friend...from Dad! My Dad is on Facebook. He wanted to find some long lost friends, so he signed up. At 74, he got a tattoo and signed onto Facebook. Happy Birthday, Dad! Keep doing what you're doing and you'll be fine! My daughter is a college graduate. Yes, Beena- my eldest- graduated today from Adelphi University with a Bachelor of Science degree in Math. Those were the quickest four years of our lives. Three thousand undergrads and graduates walked across the stage at Nassau Coliseum. Three thousand brown and gold students switched their tassels from one side to another. Three thousand students cheered when the President of the School congratulated them on being the Class of 2010. And my Beena was one of them. Beena, one part of your life has ended, but another, more important part has begun. You have officially become an adult. If you were not going on next year (and this summer) for your Master's, you would be starting to look for a job. A real job. Such responsibilities to look forward to! And maybe a little scary? I see only good things for you in the future. Your work ethic is wonderful- who, at the age of fourteen, was running their mother's business for them? You were. You were a full time student and managed to practically run the retail store you've worked in since high school. I have no doubt you'll find a job in a school you love, teaching kids you love. You love putting together lesson plans. Your favorite time of the year was always "back-to-school" because you love school supplies. You were born to teach. I am so proud of you! Don't be discouraged or afraid to do those adult things you're going to have to do in the future. Daddy and I will always be here to help and guide you when you need us. Please don't think we're crazy. We love you and always want the best for you! Oh, and thanks for graduating! Since I didn't go to my college graduation, going to yours was extra special to me. And yes, we'll be going to your Master's ceremony same time next year. We wouldn't miss it. We've got this graduation thing down- we know what to expect! So conGRADulations, graduate! The world is yours- take advantage of it! There is so much out there to experience! Love you, Beena! Lots and lots and lots. Right? Right! Begub...begub...begub. Synchronicty. No, not the Police Album (even though it is one of my favorites.) I’m talking about the experience of two events that are apparently unrelated occurring together in a meaningful manner. It’s happening to me more and more, and in more startling ways. Even Zombiegirl is noticing. Or maybe I’m just in tune with the world these days. Like waving to my neighbor in his red pickup and then seeing four more red pickups -not his- on the way to the train station. I notice things. I’m paying attention. Example Number 1: I’m web surfing at work and I hit one of my Web Pals. She mentions that she just bought tickets for Roger Waters- The Wall Live. The SECOND I read this an email pops up in my second monitor. It’s an update from Nassau Coliseum. The featured event? Roger Waters- The Wall Live. Example Number 3: I just took two books out of the library-"The Little Giant of Aberdeen County" by Tiffany Baker and "Raven Black" by Ann Cleeves. I finished Little Giant (which was really good) and I started on Raven. Somewhere well into the book, they mention one of the characters going to…Aberdeen. Example Number 5: Driving to the gym at 5:30 in the morning, I listen to the Z-morning zoo for the eight minutes it takes me to get there. On the way there, I hear Taio Cruz' Break Break Your Heart. I park, and walk the block to the gym. Halfway into my workout with Mike, I hear Break Break Your Heart. I leave the gym a half hour later, get into my car and guess what song comes on the radio while driving home. Go on, guess! These are all little things, but noticeable to us. Is anyone else experience coincidences, deja vu or synchronicity lately? If you go to Iguana for dinner, I totally recommend the fresh guacamole appetizer. A dude comes over to your table and makes it for you. Holy Guacamole, is it good! Tofu fajitas for me, shrimp tacos for Jodi. This place has never failed me! The play was really good, too. I always regretted not seeing Kristen Chenowith when she played in Wicked, so I was looking forward to seeing her in this. Due to her recent appearance on Glee, there were a bunch of "Gleeks" there just to see her. Okay, there were also a LOT of GUYS there to see Sean Hayes, who plays Jack on Will and Grace. Jodi dubbed them "Just Jacks." He's a very visual comic, and although he isn't foremost a singer, he did a pretty decent job. The week had it's moments, though. Thus the next installment of F*CK YOU Friday! More bus drama. F*CK YOU to the Asian lady with the stinky fish riding the bus last Monday. How on earth could one eat something that smelled so disgusting? We all breathed DEEPLY when you got off the bus. F*CK YOU Faisal Shahzad for leaving a bomb in Times Square Saturday. It was the day after Jodi and I enjoyed a nice stroll after the play through the madness of Times Square. That was a little too close for comfort, you terrorist prick. F*CK YOU to all the little mice living in my garage. They've nested just about everywhere- in every box, every bin and bag we have. We've had to clean out box after box of garage sale items, party place stuff and memorabilia. Sadly, we had to toss a lot of things because they were completely ruined. Including all the colored sand I had promised to Little Saints Preschool. Not only was there a nest in the box and all the sand stunk like piss, there were dead mice in the bin as well. Good thing we checked before bringing it to the school! How long have they been in there? Time for more of these. F*CK YOU to the visiting team the Panthers played last week. Not only were the parents obnoxious and loud (and on a Player's Weekend- it's a game where the players can play with no distractions from the parents or the coaches) but I counted five, FIVE, white Yukons in the parking lot. Do you know how big a Yukon is? I'd have to drive 100 Prius' to offset the footprint of a Yukon. And really people, did you all PLAN to drive the same car? I'm friends with all Zombiegirl's teammates parents. I would NEVER purchase the same car if one of them bought a new car. T-A-C-K-Y. F*CK YOU to everyone who didn't wish me a Happy Birthday (hellooo CAFM TEAM) or remembered the next day. Just because I'm old doesn't mean I'm not young at heart and don't still enjoy celebrating my day. Where's the love, guys? New post tomorrow! And that picture is taken with my Android. Not too bad! Another post coming soon. Damn work keeps interfering with my blog! I crossed my fingers as we went through the revolving doors. This was the fourth time we were trying to see the Exhibit. As we crossed the lobby, Zombiegirl spotted members of her own species- striped, goth-like people wearing articles of clothing featuring that broad, smiling skull face, colored hair and high-topped Converse. Splashes of bright color against dark brooding clothing. She pointed out to me everyone going to the Tim Burton exhibit.*. She fits right in. I kept my fingers crossed as we waited on line at the Guest Services desk. Waiting for tickets through my company's corporate sponsorship. This was our only hope since the exhibit has been sold out for weeks and it was closing in five days. This was our only hope since Zombiegirl wouldn't be coming to work with me until the summertime. She was here today because it was Take Our Kids To Work Day and it was her last chance. I crossed my toes just to be on the safe side. The bored girl at the desk told us there were no more tickets left. They give out the Corporate tickets first thing in the morning and they were all gone for the day. I wanted to cry. We struck out again. Zombiegirl looked so upset. She couldn't believe she wouldn't be able to see her hero's work. Burton is the Director of all her favorite movies, the man who has directed her favorite actor. We've tried four times- why couldn't we get in,? she asks. We have bad luck, I tell her. I offer to buy her something from the MoMA bookstore, knowing they have the Exhibit book. As we walk back across the lobby, she spies a girl a little older than her sporting Jack Skellington shirt, bag, hat and socks. They make eye contact- Z-girl staring at the outfit, the girl staring at her red-streaked hair. The girl's mother notices them staring at each other and quick turns to me and asks me if I need a ticket. Her other daughter wasn't able to make it that day and she has an extra child's ticket for a half hour from now. I told her I couldn't get another ticket for myself and she tells me to buy an individual membership and they give a free ticket. A total stranger helps us out. After thanking her profusely, we go over to the Member Services desk so I can buy an Indivdual Membership. What? It costs $75? No, that must be for a Family Membership. No, it's per person. I turn to Z-girl and tell her I can't afford $75. That dejected look is starting to kill me. Do you want to go by yourself? I'll wait outside for you. No, maybe that's not a good idea, I think. Do you want to go with the lady that gave us the ticket? No, she's gone already and I really want to go with you, she says. The walk to the bookstore is quiet and heavy. Inside, we see the display of Tim Burton books. Zombiegirl picks up an enormous art tome and starts reading. She wants this one- full color photos, harcover, two inches thick. It's $69. This day is killing me! I steer her to the $20 book- she looks through it and agrees. After walking around a little we find TB playing cards. She's a little happier as we wait on line. When we're called next, we put our purchases on the counter, but the salesperson turns to another customer who had asked her a question. She tells them they're all sold out. Another Burtonesque-type couple asks her something and again, she tells them they're sold out. She turns to us and apologizes as she rings up our things. What are you sold out of, I ask? Tim Burton Stain Boy t-shirts. I tell her that's not the only thing they're sold out of- and proceed to lament how we've tried four times to see the exhibit, how much Zombiegirl loves Tim Burton and how we won't be able to come back to try again. How I tried to get tickets through Corporate Sponsorship. She looked at the kid and was quiet for a moment. First, she says, I can give you 20% off your purchases for being a Corporate Sponsor. She asks me if I can wait around for a few minutes, she wants to check something out. She tells me, very quietly, that she has to get an employee guest pass for her husband who's coming in later that day. She said she'll check to see if she can get two more for us. She said SHE feels bad that we've tried four times to see the Exhibit. She said Zombiegirl's face makes her sad. We wait on the side of the line while she runs off, dodging tourists and Burton fans. Ten minutes later she comes back with two employee passes and a big grin on her face. As she hands them to Z-girl, she smiles even wider, saying the look on the kid's face is totally worth it. As I burst into tears (ignoring Zombiegirl's admonishments about my crying) I ask her for her name. She hands me her card- she's the store manager- and I give her a hug. Thanking her and telling her people just don't DO nice things in New York, we laugh and make our way back upstairs to the Exhibit. Which was awesome and SO worth the agony of dejection and waiting. Walking back and forth in the crowd of people recognizing early sketches and artwork of Tim's characters. Seeing the suit Johnny Depp wore in Edward Scissorhands and having Zombiegirl almost faint. Picking out your favorite Jack Skellington head of the 30 on display. Watching the gross but funny Stain Boy cartoons. And it wouldn't be possible without the kindness of strangers. Thanks, Justina! * You've restored my faith in the human race. UPDATED: *Names and links have been changed and deleted to protect the innocent and good. One of my favorite gifts I received this birthday was one from Rob. Rob Schiff. Best Man, musician, personal IT support, printer, Showerhead and all-around great guy. He's a friend of ours that's closer to our family than some of our family members. I remember going to my great-Grandmother's house and using this little guy to pour milk over my cereal. MR remembers having one too as a kid. I don't know how Rob knew we would remember this from our childhood. He must have known it would fit so well with these. Thanks, Rob. 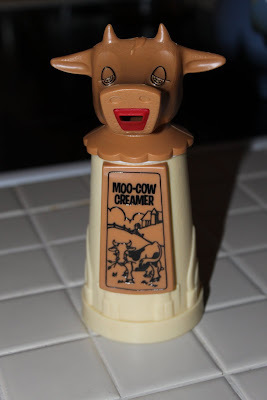 I think everyone needs a Moo Cow Creamer! The love started on Wednesday, celebrating my birthday. The girls took me out for lunch to the Brick Lane Curry House Too- the home of the hottest curry dish in North America. No, I didn't try it. I was too chicken. The place was tiny-it seats 14- but the food was delicious. This satisfies one of my 101 in 1001- trying a new restaurant! After a pretty unproductive day at work, where almost no one (including the team I work with)wished me a Happy Birthday, I left a little early to go home to my family who was waiting to take me to Thai food. Indian and Thai in the same day? This must be Heaven! What made it extra special was that Dad joined us! Now this wouldn't be such a big deal to most. It was to me since my parents always refused to try anything outside their comfort zone. They knew what they liked. If they didn't think they would like it, they wouldn't try it. This included eating most ethnic food, traveling outside the country and watching popular tv shows. That was okay, though. They stood by their convictions and didn't feel like they were missing anything. Except dinner with their family on my birthdays. We would go out for Indian, or Mexican, or Thai and they would meet us back at our house for cake. This time, though, Dad went with us to Frankly Thai (otherwise known as Onzon). AND he tried the spicy, crispy noodles! And lived! I am so proud of him, and honored that he was willing to go out with us. He said it was good, and I'll choose to believe him. After dinner we had cake back at the house and I opened my presents. A bread maker from Dad (along with three bread mixes,) sock monkey slippers from Zombiegirl, from MR-tickets to Promises, Promises on Broadway, a rain barrel, topsy turvy tomatoes and an Amex Gift Certificate. From Beena- a HUGE bread recipe book. Wonderful gifts from my wonderful family. Thanks you guys! The best part of this day, though, had to be the fact that I wasn't turning a year older than I thought. Since MR is three months older than me, I automatically start saying I'm the same age he is whenever anyone asks. I must have convinced myself I was already 47 and started saying I was turning 48. It took Soulspeak23 to remind me I'm a moron and I'm a year younger. Hooray! I'm NOT 48! Now the kids will have the books (no cost to me, yay!) and a place to take notes. The ONLY thing a Hogwarts student would be using to take notes is a quill pen, right? I need feathers. Michaels had packages of turkey feathers in white and different colors (black for Z-girl) so I picked up enough for everyone. When I got them home, however, I realized the shaft wasn't hollow. Well, it would be hollow if it didn't look like it was vacuum-sucked in. I got a Bic pen insert about an inch up the shaft (OMG this is sounding so dirty….) before it couldn't go any further. CRAP! I remember making quill pens when I was a kid using seagull feathers I found on the beach. I definitely couldn't use these Michaels feathers so I started researching were to by genuine feathers online. I found a feather place on West 38th street in the garment district. I called and they confirmed they had feathers I could use for pens. I promptly forgot about the quills until the Wednesday before the party. I HAD to get these feathers the next day since I wasn't going in to work on Friday (stove repair man coming). I figured I would stop in the morning when I get in to Penn Station. 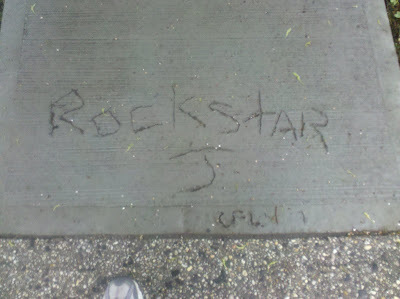 After a late start at home on Thursday, I got into the city and walked up to 38th Street. I turned THE WRONG WAY (WEST) on 38th Street and didn't realize it until I ran out of buildings, somewhere around 9th. I called the place and they said they were between 6th and 5th. Wonderful! It's the first hot day of the year, I'm totally overdressed, and now I'm four VERY long blocks out of my way. And late. I get to Dersch Feather and am blown away by the amount and beauty of all the feathers they have displayed. My mind does a creative flip trying to think of what I could possible do with all this! John snuck up from behind some boxes and when I told him what I needed, he was thrilled! Seems like he's a Potter Head, too. Had the Hogwart's denim jacket to prove it! But…he couldn't tell me what type of feather was used for the quills. He showed me a few and we settled on the turkey feathers. The shaft was indented in like my other feathers, but a little higher- I would be able to get more pen up the shaft. Twelve dollars later (cash- no debit, no credit- I had to leave to find a cash machine) and I had a handfull of long white quills. Since I'm not versed in the Manhattan bus system, I couldn't figure out how to get uptown on the east side, so since I was late anyway, I walked. From 38th Street to 48th Street. Sweating, carting a bagful of Girl Scout Cookies and feathers. Mama's not a happy one, this morning. I get to work, down a full bottle of water, race like a pee horse and log into my workstation. I scout out the supply cabinet for pens, and come up empty. Crap again! I'm going to have to buy Bics. Thank goodness they're cheap, around $2 for a pack of 10. When I get home I start trimming the ends of the feathers and pulling out the inserts of the pens. I try to stick the pen in the shaft, but again, it doesn't go all the way in. Now I'm desperate, and start cutting the pens to fit. And getting ink all over my hands, the table, the feathers and the scissors. I try to do the rest in a neat and clean manner, but my hands turn slowly blue-black over the course of this craft. It's okay- I managed to get all the pens in, glued where they're a little loose and standing on end so the ink doesn't run back into the feather. 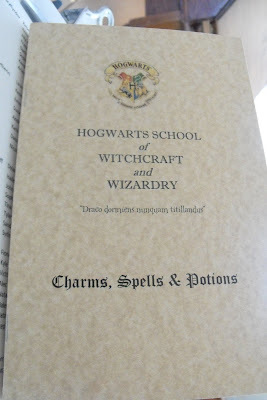 Now our little Hogwart students are ready to take notes!